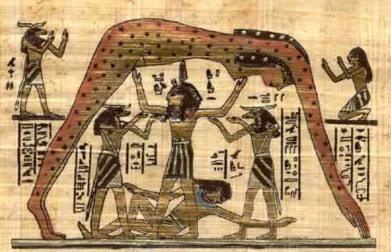 Tefnut, before you were born. How mighty is your heart! Great One who has become the sky! shall join the whole earth to you in every place. He so loved you that he placed himself and all things beside-beneath you. This love-poem contained the essence of Nut’s character: she was the sky who shared a very special relationship with the earth beneath her. Nut became pregnant by her husband and was supported by her father. Each day the sun god passed through her on his voyage in the solar boat, and the stars were part of her being, as children are part of their mother.